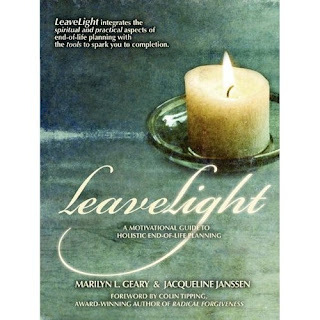 Today we welcome Marilyn L. Geary and Jacqueline Janssen, authors of the new book LeaveLight, to our writing blog. They share a discussion about their book with Sarah Moore with Writers in the Sky Creative Writing Services. SARAH: Please share the premise of LeaveLight so that we will know something about the genre and content of your book. MARILYN: LeaveLight is a spiritual and practical guide to advance planning and leaving a legacy for your loved ones. It offers tools that motivate you to provide directions for your loved ones in the difficult time after your death. LeaveLight makes this easy by helping you organize your life’s planning into a Legacy Binder that contains your personal data and information on your health, your possessions and your final wishes for you and your family. JACQUELINE: LeaveLight provides exercises and visualizations that help you focus on the qualities of forgiveness, compassion, gratitude and surrender. By reviewing your life and its relationships, you are able to move forward with fewer regrets. LeaveLight does not offer legal, financial, or therapeutic advice. It does offer motivation and resources to assist with advance planning. SARAH: How is the book formatted? What kind of layout and content can readers expect to find inside? Fire—Your Winter of Surrender, a chapter on planning final arrangements. In the last chapter, Coming Full Circle, the reader creates a legacy letter spelling out wishes, decisions and values for loved ones left behind. We have included forms for documenting useful information and a list of resources in the appendix. SARAH: What inspired you to write this book? MARILYN: One evening over a meal at Café Gratitude in San Rafael, California, Jacqueline and I were talking about things we had not finished, including putting plans together for our family members should something happen to us. We found that we both had experienced unnecessary trauma after family members had died. My husband died unexpectedly at age 52. Although he had been ill with emphysema for a very long time, I did not admit the severity of his illness. We continued on with life as if it would continue forever. When my husband abruptly died, I had no plans in place. I had to search for a burial plot while my husband was on life support in the hospital intensive care unit. Although I knew he had very strong feelings about the subject, I could not remember whether my husband wished to be cremated. JACQUELINE: My parents also died without plans in place when I was young. My siblings and I had very different ideas about what our parents wanted, and even different religious beliefs about their funerals. We were each so sure we knew their wishes. It meant so much to us to treat our parents with love and respect that we argued when we could have been there to comfort each other. It took us a long, long time to heal and finally grieve and become a family again. So both Marilyn and I realized we were not alone. So many people don’t plan, don’t let their families know what they want, and family members undergo added stress and trauma at a time when they need to grieve. Hard decisions shouldn’t have to be made when people are suffering. We realized we could help people by finding ways to motivate them to do what had been so hard for us. SARAH: Why do you believe there is such a hesitancy to discuss some of the end-of-life issues that you cover in LeaveLight? How does this lack of conversation serve as a detriment both to the person whose death is being discussed and those who will be left behind? MARILYN:The reluctance to plan is largely due to the tremendous fear of death in western culture. Death is the enemy, a mistake. We don’t want to talk about it. Most people are simply afraid to face it. They prefer to think that it’s not going to happen to them. Consequently, seven out of ten people in the United States have not created a will, and polls show that 90 percent of people say they want to die at home, but only 20 percent do. Fewer than 10 percent of people actually use an advanced directive that specifies their wishes for health care should they become incapable of communicating them. JACQUELINE: In some cultures people intentionally prepare for death throughout their lives with forgiveness and compassion so that by the time death occurs they are free from guilt and feelings of incompletion. LeaveLight helps readers consider what does stop them from planning, not only for themselves but to help the ones they love. We give readers a way to look at what will motivate them to plan by focusing on reasons they do want to do it. It could be that they want to establish care for people who depend on them, or leave life without regrets. Or they may have a deep wish to forgive and be forgiven. A free list of these possible reasons is available on our website. LeaveLight offers readers a way to bring their fears to light and work through them to complete their planning, especially in small, supportive LeaveLight Circles. SARAH: Do you both bring a writing background to LeaveLight? Are you coming from the perspective of professionals in the field? Or, are there other aspects of your personal backgrounds that contribute to the content of the book? MARILYN: I am a media artist, writer, instructional designer and personal historian. As a personal historian, I understand the value that recording life stories can bring to families. Many of the narrators I have interviewed over the years have since died. Their stories live on for generations to come and bring comfort to their family members still living. My background in media and instructional technologies has helped form the design of LeaveLight into manageable steps that make it easy for readers to complete their planning. JACQUELINE: I’ve been working with people throughout my career in the field of human resources. I am the Director of Transition Services at the Center for Volunteer and Nonprofit Leadership of Marin, providing professional executive recruiting for nonprofits. I enjoy helping people reach their full potential, and I think this is best done through good communication and healthy families. Marilyn and Wendy Dunne and I worked with the County of Marin to create and implement a Family Partnership Policy. With LeaveLight, people not only communicate their wishes to their families, but they reflect on their own lives. By putting plans in place in advance, people lessen their stress and worry about what will happen to their families and others they love. Then they can enjoy life, each other and each day as perfect and sacred. Marilyn and I both share a belief in the power of gratitude, forgiveness, compassion and surrender to enliven and free our lives from regret and unhappiness. SARAH: How long did it take to write this book? Is there information you can share with us concerning your writing method or how the book developed? JACQUELINE: We spent over three and a half years writing LeaveLight. At first we planned only a practical guide with forms, but as we progressed, we realized the importance of addressing the emotional aspects of end-of-life planning. SARAH: How did you publish your book? Tell me about your publishing experience with LeaveLight and what you learned from it. MARILYN: We very quickly came to the conclusion that we would independently publish LeaveLight. We were aware of the difficulties of getting an agent and a publisher and the long lead times in sending a book through the traditional publishing channels. We did not want to spend our energies in that direction when we would end up marketing LeaveLight ourselves in any case, We had the technical expertise to independently publish, and in so doing, we retained creative control over our book and over its sales. SARAH: Where is your book available? Do you have a Web site or blog where we can learn more about you or your book? JACQUELINE: LeaveLight is available on Amazon.com, Barnes and Noble.com, and other online outlets, as well as through our website and blog. SARAH: As far as marketing, do you do more online publicity or print/radio/TV promotion? Tell me some ways you have promoted your book. JACQUELINE: Our marketing program is just getting started. If we could do anything differently, we would have started marketing earlier. We designed our marketing plan to include a website and blog. We write articles and make comments on other blogs about advance planning topics. Our certified facilitators reach out in their communities to sell the books and deliver the six-session circles. We enjoy being guest speakers, and we deliver short programs on LeaveLight. SARAH: Do you have any future writing projects in the works, or any other work you will be doing associated with end-of-life issues? JACQUELINE: We plan to add video testimonials to our LeaveLight website. Participants tell what they have experienced with their families and in their lives as a result of reading LeaveLight, participating in the Circles and completing their planning. These stories are very moving. We continue to update our blog with stories and video interviews of experts in end-of-life concerns and of ways that people relate to and celebrate their loved ones and life in general. SARAH: Any other comments you would like to share about your book LeaveLight? JACQUELINE: We encourage people to plan for their loved ones and live life to the fullest, every day. Please don’t miss a minute to forgive yourself and others, offer compassion, be grateful and surrender to the beauty all around us. MARILYN: LeaveLight is not about dying—it’s about how we live and the legacy of love we leave behind for others. SARAH: Thank you for giving us the opportunity to get to know you and learn about your book. I wish you both well in your journey with LeaveLight. In 1999, Yvonne’s life took another dramatic shift and brought the spirit world even closer when she experienced a walk-in or soul exchange in which the soul that was inhabiting her body left for the afterlife and a new soul took up residence. Her religion could not explain it, her church friends abandoned her, and the world (even her family members) seemed unfamiliar as the adjustment took place. She shares openly about this common, but little-understood phenomenon in the book she wrote about death, dying, afterlife, and spirit communication.